Online shops rarely sell just a few products. If your shop has a few hundred or a thousand articles, it might help if you offered your customers a filtering option. You must do whatever you can to help your customer get to the desired product as soon as possible. Ecommerce filters can help you solve this problem. Why should you use eCommerce filters? Ecommerce filters help you to break down long lists of products into manageable results. If you implement them correctly, your clients will thank you with a higher conversion rate. But, only if you think these through. To achieve that, you must first make sure to tag your products properly and develop an accurate system of filters. Think about how people search your shop; do they drill down into the specs or are they more like seasonal shoppers looking for a new coat for autumn? The kind of filters you choose, depend on the kind of shop you run and the products you sell. Electronics have lots of specifications that can be placed in a filter. A shop that sells handmade scarfs can use filters for the material used or maybe what kind of style it is (urban, chic, outdoor, to name a few). 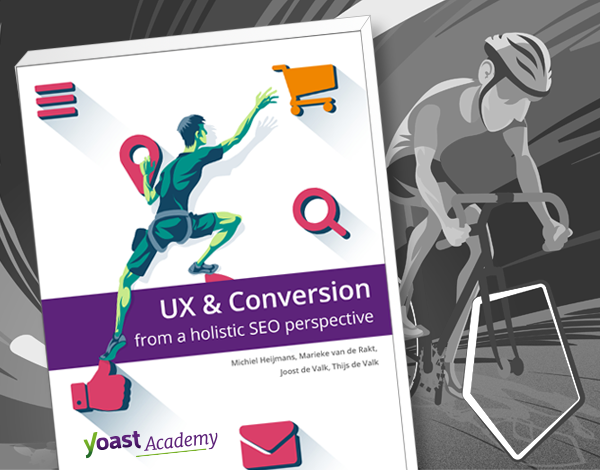 Flawless UX and usability are very important for SEO. If you make your site function without fault, and your visitors can easily find what they want in your shop, you’ll get lower bounce rates and higher conversion rates. These are all signs for Google that your site works like it should and could result in higher rankings. These kinds of filters do come with a warning, though. If developed and implemented incorrectly they could harm your SEO. You do not want your CMS to automatically generate new URLs for every search query. Tread carefully. We’ll dive deeper into this in a later post. A well-thought out filter system can save the consumer an enormous amount of time and frustration. Most of the time, however, we see filters that haven’t been properly developed. Think about all the shops where they implemented a site-wide filter. Don’t do this. That might be ok if you have just a few products in similar categories, but not if you’re aiming to be Amazon. Think about that for a moment: how would you ever find anything on Amazon if it wasn’t for that excellent filter system? So, you have to have category-specific filters. Place these front and center on your category pages. People shouldn’t miss this, because if they can’t find them, these filters don’t exist. In addition to that, if you only use site-wide eCommerce filters, some filter options won’t fit the category a customer is browsing. Filtering for a white, 18 megapixel, point-and-shoot camera doesn’t make sense when you’re on the DSLR category page and want to select the best DSLR cameras under $500. If you want to see how filtering ought to be done, you have to study Amazon. This eCommerce behemoth tries to help customers find what they want in as little time as possible. Let’s say you are looking for over-ear headphones, that have good reviews from buyers. 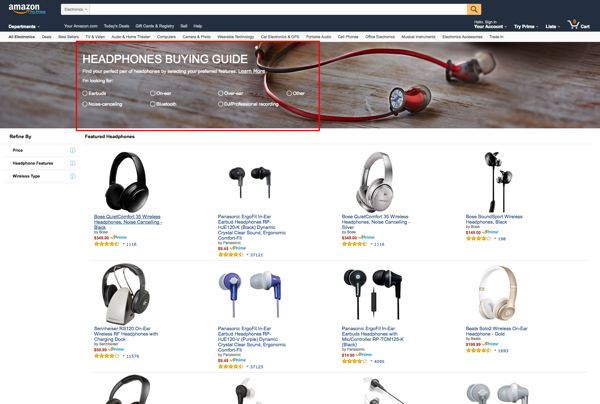 To help you with that, Amazon has made a buying guide for headphones that you can reach directly from the headphones category page. 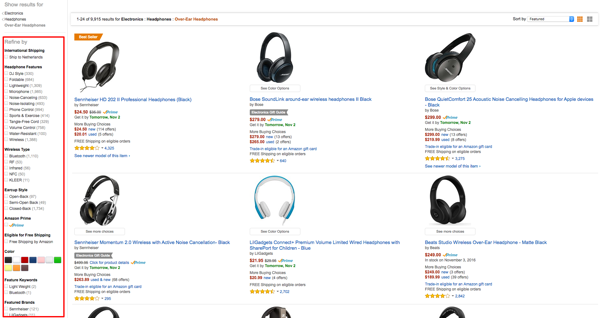 On this page, you can select which type of headphone you are looking for, and Amazon instantly presents you with a list of suggestions. You can narrow it down further by filtering on price, features or wireless type. By doing this, Amazon has done a lot of hard work for the customer. In a couple of seconds, you have a manageable list of headphones to go through. In addition to the buying guide, you can reach the regular, more expansive filters by going directly to the over-ear headphones category. This shows you 9,915 results, but they can be easily narrowed down by a plethora of filters, like features, earcup style, color, featured brands, customer rating, et cetera. This gives you everything you need to find what you are looking for. 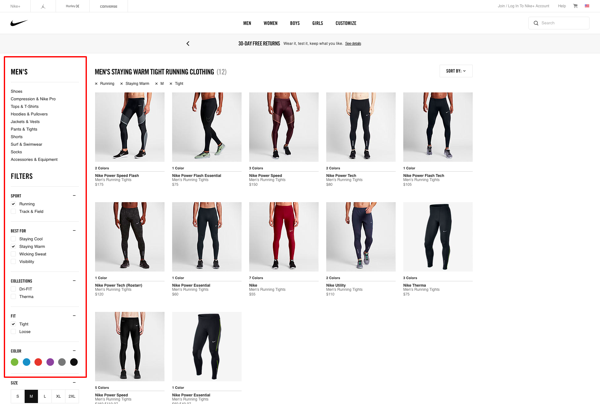 Nike.com lets you easily filter types of products based on actual questions customers have. Choose the product category, then the sports, what you want it to do (keep you warm, cool, visible, et cetera), then a fit, a color, and size. In the end, you’ll be presented with just a couple of products that match your specific filters. Looking for a new couch can be one of the most frustrating experiences ever. It’s something you don’t buy every month, plus it will last quite awhile, so you have to be sure of your decision. It can take some time to find the perfect couch. Wayfair helps customers filter their enormous couch selection with an impressive filter system. Wayfair.com must the king of filtering since they use every filter type known to humanity, but still keep it manageable. In the couch section, you can filter on the popular options, but also handy ones like style, print, back style, application, frame finish, et cetera. It’s a massive array of filters that lets you narrow down the search results to specific products that match your specifications perfectly. The flip side of offering all these filters is that you have to make sure they are usable. Don’t present a list that never ends. If you have loads of option in a filter section, please truncate these. Mayfair also uses a big + button to hide sections you don’t need. Another option is to make a list scrollable, although it’s probably better to truncate. Test whatever works for you. On a side note, Wayfair has another way of keeping customers sane. 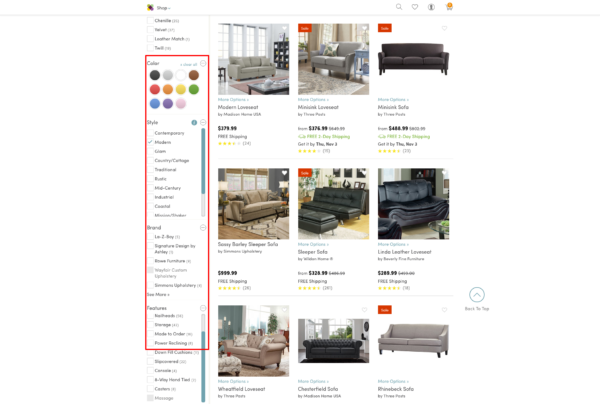 Check out this Pinterest-like board feature where customers can save their selected couches and compare them later on. 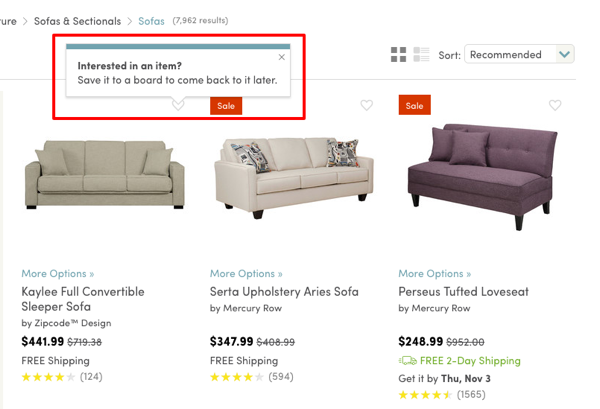 This makes it so much easier for clients to patiently shop on the site, without having to think about what that one couch was they’d like so much. Ever went shopping for a camera bag only to find out the one you bought doesn’t fit? Well, you’ve probably drowned in a sea of bags and picked the first one that could have fit based on the size specifications. I think we’ve all been there. If you want to help your customers, you should offer a compatibility filter. On B&H you’ll find your camera bag in a jiffy. 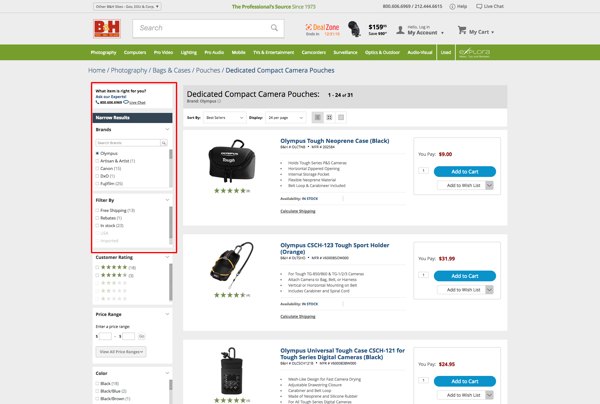 Select the dedicated camera bag category, find your brand, add some specs and away you go. You can even search the results if you want. How cool is that? Filtering helps your customers find what they want and find it quickly. However, only if you’ve thought long and hard about how to present your filtering options. There are lots of ways to go about this, and you have to pick the ones that fit best your online shop. Whatever you do, make sure the filters are visible and logical. Hidden filters stay hidden for visitors. Don’t miss this great opportunity to get them to their products fast. It’s a great service to your customers. Do think about the technical implications, though. Incorrect use of the technology behind filters could make the CMS generate new URLs for every search and that’s something you absolutely do not want. The implications for your SEO could be great. We’ll elaborate on that in a later post.